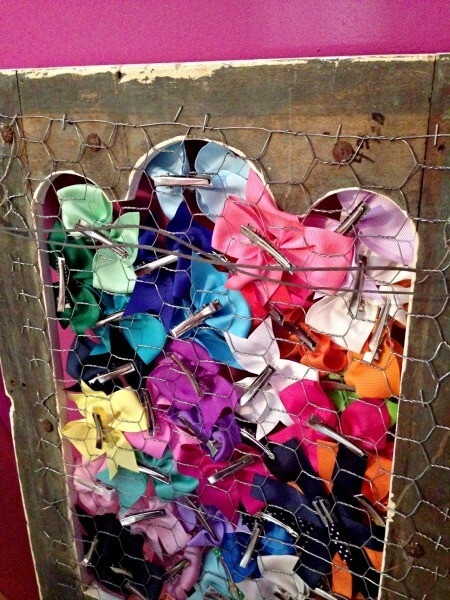 THE BOWS! I don’t think I had any idea when Chickadee was born how the bows would take over. 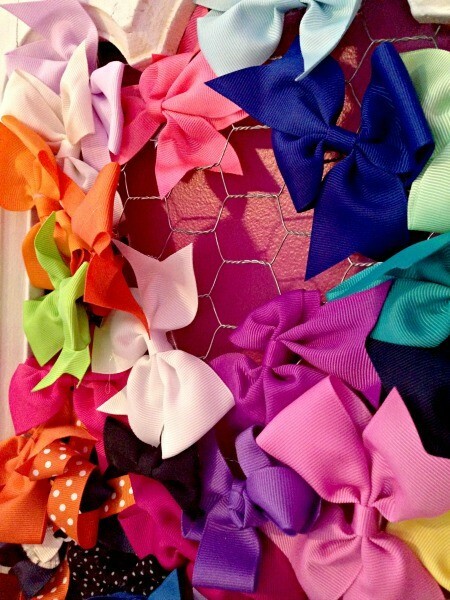 We have so many bows. I have several friends whose little ones won’t wear the bows, and I know there are pros and cons here :( I’m not sure how no bows would go over here, some things Chickadee and I compromise on (like not wanting to wear these cute mary janes I bought her for preschool and instead wanting to wear tennis shoes like all her friends, why does it start this soon?????) but not the bows. With her crazy beautiful curly hair we need to look like we try and maintain those locks and that is where the bows come in! As she has gotten bigger, so have the bows. After wiping down the frame, I gave the front a quick coat of white paint. I wasn’t perfect and if anyone asks I am going for the distressed farmhouse look :). Then I unrolled the chicken wire to be 3 inches wider and longer than my 12×18 frame opening and cut it with wire cutters. Finally using one of my favorite tools, a staple gun, I attached the chicken wire to the back of the frame. EASY. PEASY. 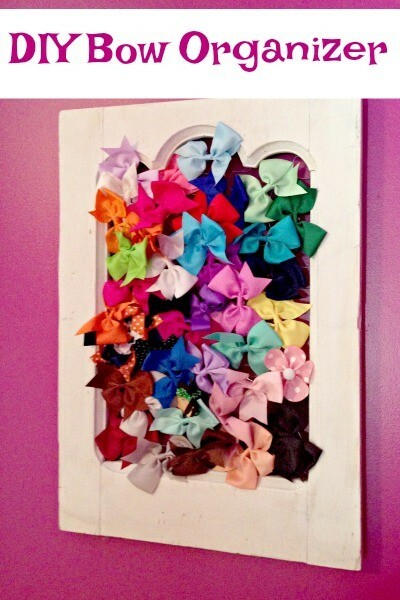 Finally I clipped on the bows and hung it on the wall. I’ve been training Chickadee and she knows to look at the colors in her clothes and then find a bow that matches. She really does love them. I often ask if she wants me to pull her hair back with a ponytail instead and 9 times out of 10 she says she would rather have a bow. Mission accomplished! It’s been a little over two years since we moved into our home and we couldn’t be happier. What started as the not so perfect house in the perfect neighborhood is slowly becoming the perfect house surrounded by the best friends! We have a habit of looking for hidden gems. Houses that have a lot of potential if you can see pass either the Pepto-bismol pink master bedroom walls or white kitchen backsplash accented with pastel fruit. However, the floor plans have always been perfect for our ever growing family and with a few touches each house has become our home. Owning a home is more than likely one of the biggest financial commitments you will ever make. And finding a manageable mortgage that fits your lifestyle is crucial. To often buyers purchase a house that they cannot afford, or if they can “afford” are now house poor. So much of their monthly income is going to their mortgage that they have to limit the lifestyle they were used to to make the payment. Luckily, SunTrust Mortgage, has a team of experts committed to helping future homeowners with every step along the way. 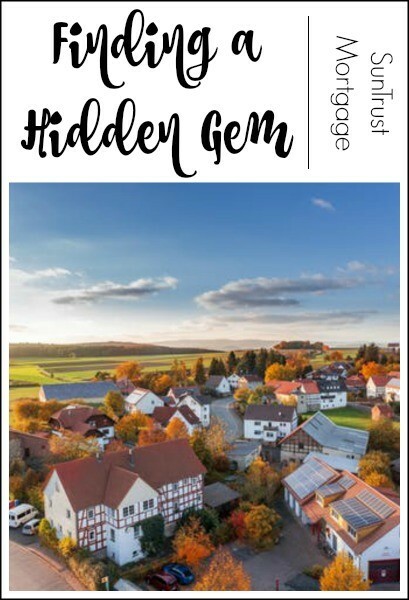 When it comes to buying a home, just like on House Hunters, you need a list of “must haves.” What is most important to you and your family when it comes to your home. We sat down and made a list when looking for our current home. On our list location was number ONE. You can change a lot about a house itself, but you can never change where it is located. We also were looking for a neighborhood with young families, a pool, and strong community involvement. Four or more bedrooms and space for a playroom were key. Since we have a young family the zoned elementary school was also important. And finally, staying UNDER our max budget…not a penny over. One thing not on our list was a house that was updated or turn key ready. We don’t mind doing a little work, I guess that is what I mean by hidden gem. Great bones, perfect location, and ready to make our own. Sometimes we do have to stray a little bit from our wishlists. For example, ideally I would have preferred that all the bedrooms be on the same level. However, when it came down to it my other must-haves were more important. Distinguishing between must haves and wishlists is important. I suggest making this must-have list before you start house hunting. We worked with a great realtor who knew these must haves and our budget. After several weeks of looking we made an offer on a home that we knew had the potential to be the perfect fit for our family. We negociated back and for because as I mentioned before III refused to go even a penny over budget. And since we were willing to purchase a house that needed a little work, we were able to get the best deal in the neighborhood around that time. With a little work over time we have increased the value of our home and our equity in the house. 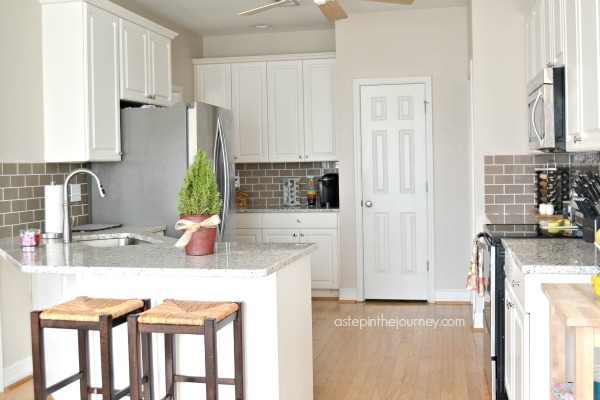 You can see our kitchen updates here. I’ve mentioned before that III is in accounting and finance, so how and why we spend our money is second nature to him. Each time we’ve bought a home he has spent hours doing research regarding mortgage rates, taxes, monthly mortgage payment possibilities, and how to make sure we don’t have to pay mortgage insurance premium along the way. I wish we would have known about SunTrust Mortgage during our buying process. It would have been great to have so many resources all in one place. So are you thinking about purchasing a new home? Then you’ve come to the right spot, because I can point you in the right direction. SunTrust Mortgage has defined the process A to Z in their “Your Guide to Home Buying.” They have answers to everything from “Are you ready to purchase a home?” to planning a monthly budget to account for your new mortgage along with your other expenses. They will help give you the confidence to make your perfect home happen and to purchase responsibly. We planted a garden. 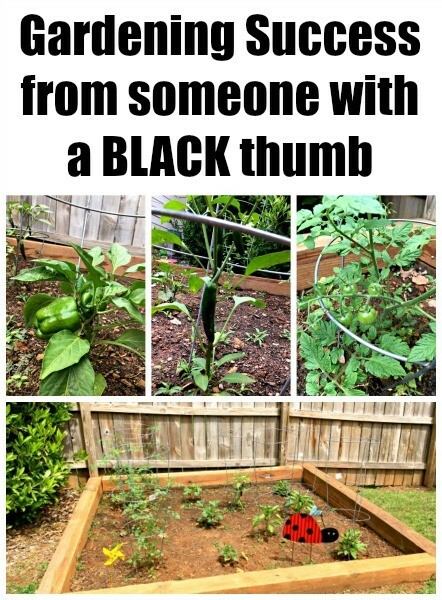 I must admit I’m not really the gardening type, probably because I have a black thumb. 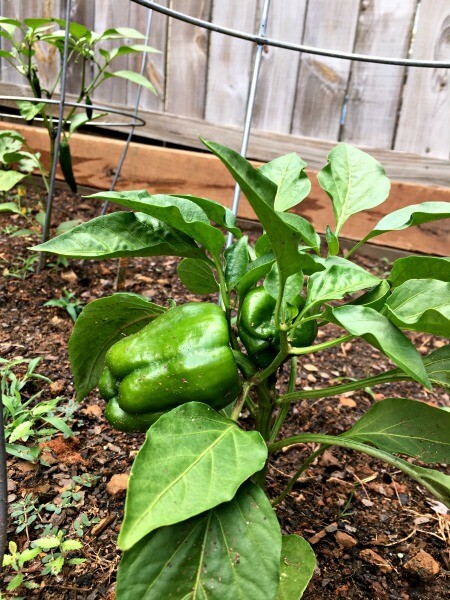 However, III grew up on 11 acres and has grown a pepper or two in his day. I knew the kids would be all over it, and so of course I was in. III used some 6×6’s leftover from the play set install that he used to create a garden bed of sorts. 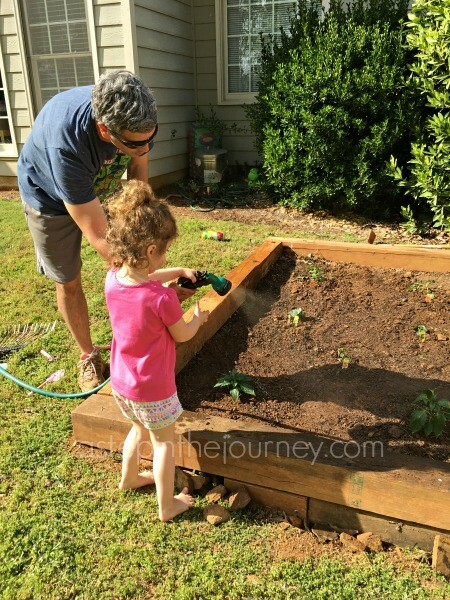 He tilled and weeded the dirt and added fertilizer. Then we headed to Home Depot to pick up some plants. 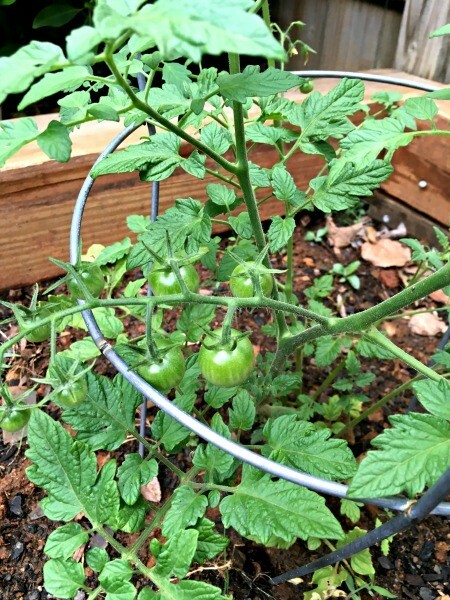 We settled on tomatoes, okra, jalapenos, bell peppers, strawberries and some herbs (oregano & basil). 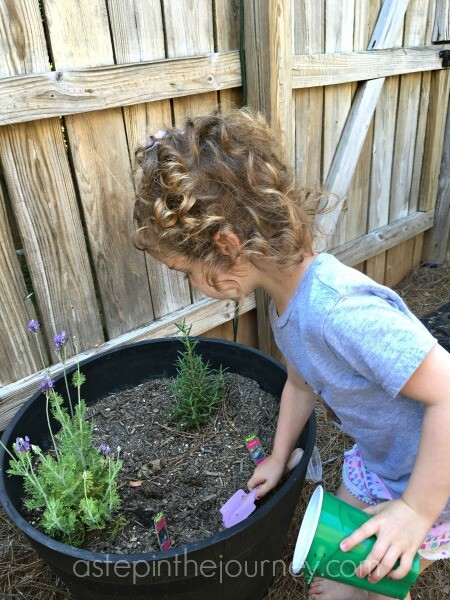 I found the cutest gardening tools in Target’s Dollar section and the kids were ready to go! They helped III plant and they help me water every day. It is incredible how fast those plants are growing. 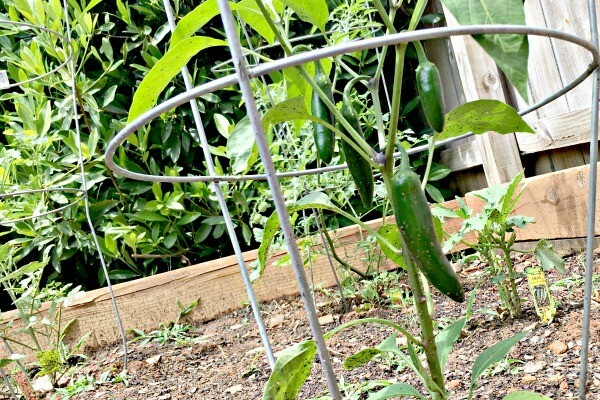 There are lots of little green tomatoes taking shape and the peppers are starting to blooms along with the okra. Check out this bad boy…just waiting for him to turn yellow. 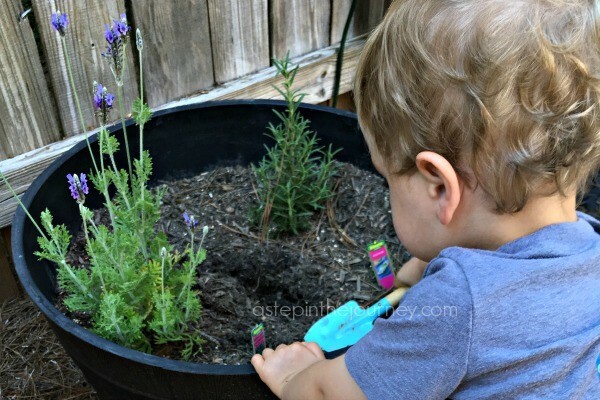 The kids are obsessed with looking for new blooms and we all can’t wait to eat from the garden. 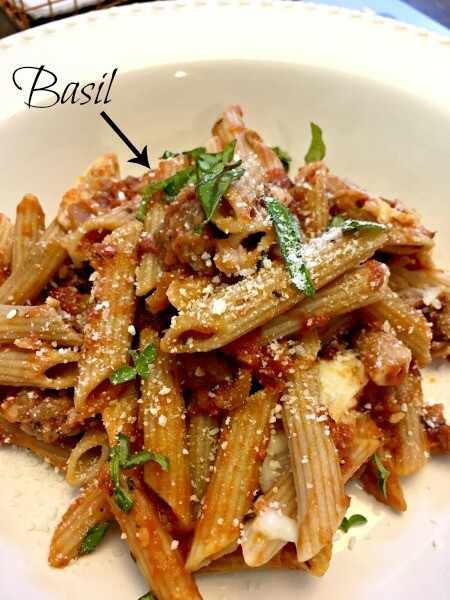 The herbs are doing great and we’ve already used them several times with dinner. So whether you have a spot in your backyard or you want to grow a planter/pot garden on your porch, I’m here to tell you, you can do it! Give it a go! And even if it fails, your kids will have fun! I hope no one minds too much, but I plan to get back to a few personal posts intermixed with the recipes and DIY. Blogging about our family is where this little blog started and over the years it’s been lost a little along with my passion for blogging. 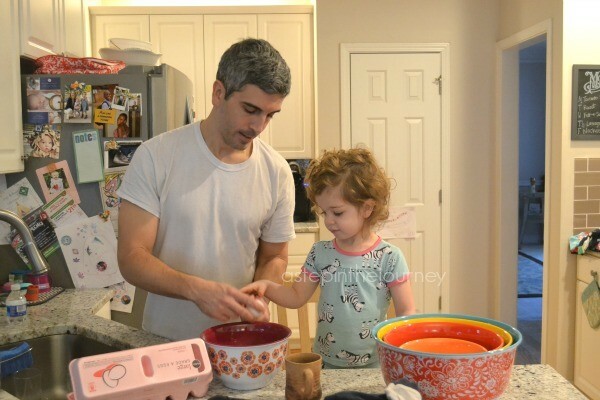 I’m hoping sharing a little bit more about our life with you along with the DIYs and recipes will help reignite that love of keeping in touch! Since it was raining we spent time int he playroom and Sprout pulled out one of his FAVORITE books as of late. 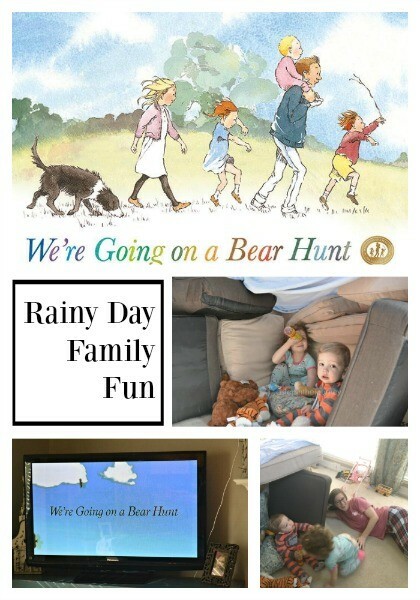 Have yall read We’re Going on a Bear Hunt with your little ones? It’s a sweet story of 5 siblings ad their dog who head out on a fun adventure to find a bear. It’s got repetition which kids love and lots of fun onomatopoeias! I strongly recommend adding this one to your library if you haven’t already. The kids do happen upon a bear in a cave and things get exciting. 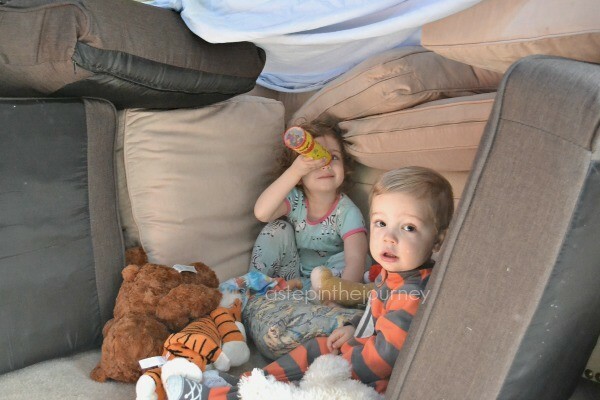 The cave prompted our kids to want to build a pillow cave or fort (which Chickadee calls a “fork”). Also one of our favorite to do when it’s cold and rainy. III love putting on his architect hat to help them build quite elaborate caves. 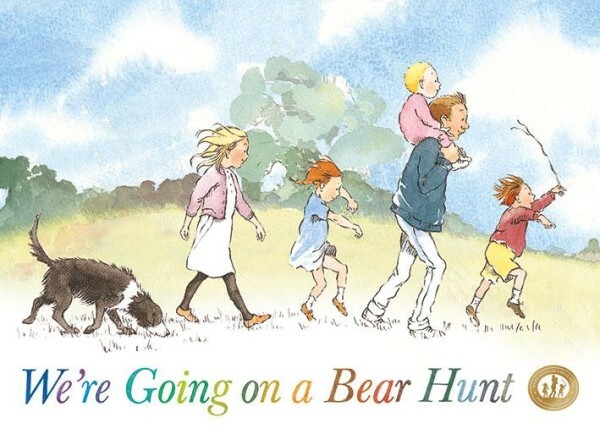 We all played in it for a while before I mentioned to the kids that we found the book We’re Going on a Bear Hunt turned into a sweet little video on Amazon Prime. Did you know you can watch thousands of things on your television as part of your Amazon Prime membership? If you want details, read a little more about it here. It was SUPER cute and the kids loved watching in their own cave. Between reading the book, building and playing in the cave and watching the video we were able to pass over an hour of our time stuck inside on this cold and rainy morning and more importantly enjoy time as a family! You could of course also go on your own bear hunt as well. Maybe hide a teddy bear, turn out the lights, and use flashlights to see who can find the sneaky bear! Hope you have a fantastic week! I’ll try and stop back by later this week to share a fun little Valentine’s craft for the kiddos. 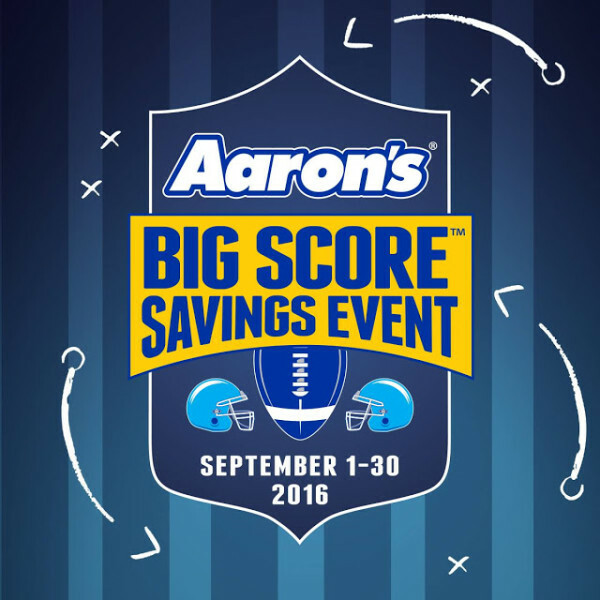 Aaron’s Big Score for a Big TV Social Sweepstakes! 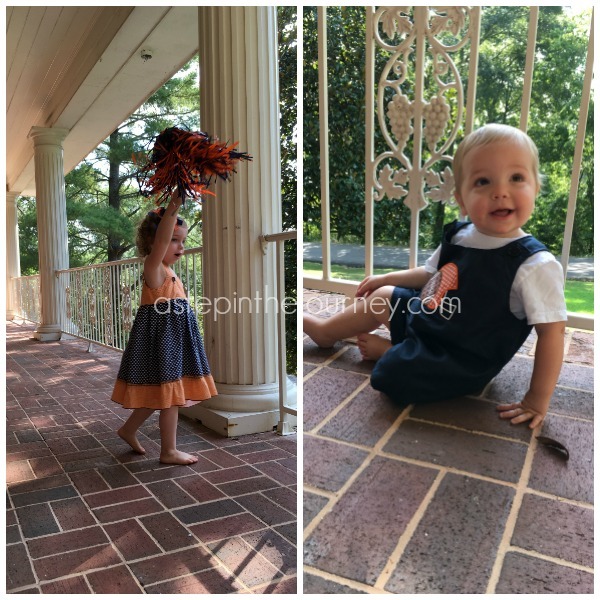 Here are my two favorite Auburn fans :) Chickadee has started to learn the fight song, and hearing her sing “Power of Dixie Land!” might be the cutest thing ever. Sprout is a sucker for Aubie the tiger. We are raising them right! War Eagle! 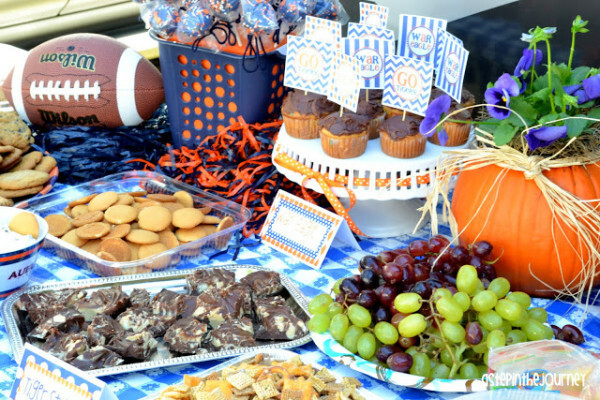 Now that we have kids we usually stay close to home to cheer on our Auburn Tigers, but when we do make it down to the loveliest village on the plains we tailgate in style, RV style! And the food spread is like nothing you’ve ever seen. 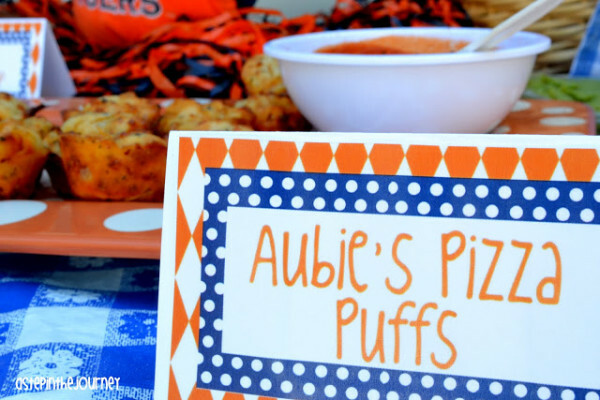 Tailgates are such an awesome time to come together with friends new and old and celebrate your friendship while cheering on your favorite team! We are actually getting together with our Sunday school class this Saturday to tailgate and celebrate the kickoff of football season. So do you have a favorite team? What are your plans to watch the game this weekend? Make sure and head over to Aaron’s to enter to win that BIG 75″ TV. Then next week the party can be at your house!! This is a sponsored conversation written by me on behalf of Aaron’s Inc.. The opinions and text are all mine.